Find device-specific support and online tools for your Apple iPad mini 4. Learn how to activate and set up your iPad mini 4. Information about accessories from Verizon Wireless. Learn about less comprehensive equipment protection options for any budget, including lost, stolen and damaged coverage or extended warranty to cover defects. Learn how to file an insurance claim. See options for replacing your phone or tablet if it's lost, stolen, broken, defective or otherwise needs replacement. Learn how to set up a new or old device on an existing line of your account online through My Verizon. Use our online tool to guide you step by step to back up and transfer content. Choose the best method from Verizon Cloud, the Content Transfer app or USBcomputer. Watch this video to learn about the features of Verizon Cloud - like content transfer, media storage, photo printing and more. Learn which plans are available for any iPad we carry, how to activate a new iPad and set it up. Learn how to activate and set up your Apple iPad and iPad Mini for both wi-fi and cellular connections. Here's how to find your AppleCare Registration Number to register the AppleCare plan for your new Apple device. If you're having issues signing in with your Apple ID password, view this info to reset it and regain access to your Apple ID account. Here's how to perform a quick set up and activation on your iPad. To update Carrier Settings (Access Point Names, MMS settings) for your iPad, view this info. Here's how to create an Apple ID using your iPad. Here's a link on to how to set up or use an Apple ID without an associated payment method. Learn how to set up your new tablet with important features and functions. Get the most out of your new tablet with these practical tips. Here's how to manage sounds on your iPad. Here's how to create and configure reminders on your iPad. Find the best way to transfer your pictures, videos, contacts and other content from one device to another. See step-by-step instructions for devices by operating system. With the Content Transfer app, it's easy to transfer your contacts and other content from your old phone to your new phone. Find out how. Here's how to export contacts to or import contacts from a .csv file or Vcard. Here's how to export your contacts to a CSV file using Yahoo Mail. Here's how to import photos and videos from your iPhone or iPad to your Mac or Windows PC. To learn how to manually manage content for quick syncing of specific items, view this info. Here's how to learn about copying files between your computer and apps on your iOS devices. Here's how to automatically transfer a backup of your old iPhone / iPad to your new Apple device during initial setup. Here's how to transfer content from your old device to your current Samsung phone. Here's how to remove a device from your Connected Devices list via the My Verizon website. Here's how to determine if your location has Verizon Wireless service available. Here's a link to an Apple support article outlining how to delete info from a device, even if you don't have it anymore. Find out how to change the name of your iPad mini 4. Discover the features on the back of your iPad mini 4. Discover how to restart your iPad mini 4. An interactive map of the Home screen and buttons on your iPad mini 4. Here's how to check 4G LTE download / upload speeds for your device via the My Verizon app. If you're having issues with your non-removable battery charging or not holding a charge, view this info. This outlines potential causes of battery issues (device not charging/holding a charge, short battery life). Here's how to extend battery life and troubleshoot battery issues on your phone. Here's how to resolve charging and battery issues if your iPhone or iPad won't power on. Here's an Apple support article for using iPad power adapters with your iPhone or iPad. Here's info on the battery specs (use time, standby time, etc.) for your Apple iPad. Here's how to charge the battery and identify supported charging adapters for your iPhone or iPad. If you want to view the remaining battery percentage of your iPad in the status bar, view this info. Learn more about Bluetooth wireless networking, and how to use it on your Verizon Wireless devices. Here's info on pairing Bluetooth with your vehicle and some FAQs. Here's how to delete a paired Bluetooth connection from your iPad. To make your Apple iPad visible to Bluetooth devices, view this info. Here's how to turn Bluetooth for your iPad on or off. To make your Macintosh OS X visible to Bluetooth devices, view this info. See how to pair your iPad mini 4 with your Bluetooth device. Here's how to add a calendar event on your iPad. Here's how to add, delete or edit info in your iPad's calendar. If you have multiple calendars on your iPad (iCloud, Gmail, Work, etc. ), use this info to set the default calendar. Here's how to turn Continuity Cellular Calling on or off for your iPad. Here's how to use an iPad instead of your iPhone to make and receive calls. Discover how to add a numbers as a new contact on your iPad mini 4. Find out how to block a new contact on your iPad mini 4. An interactive guide on how to change your call settings on your iPad mini 4. Discover how to use your iPad mini 4 to make a call. Here's how to watch a video on your iPad while completing other tasks. Here's an Apple support article on how to sync photos to your iPhone or iPad using iTunes. Here's how to record a time lapse video on your iPad. Here's how to share Verizon Cloud content from your iPad. Here's some info on camera settings for your iPad. Here's how to watch a video on your iPad. Here's how to record and send video on your iPad via the Messages app. Here's how to save images via the web browser on your iPad. Here's how to send an existing picture from your iPad using the Messages app. Here's how to send an existing video from your iPad using the Messages app. Here's how to take a picture and send it via the Messages app on your iPad. Discover how to capture a Slo-Mo video on your iPad mini 4. Find out how to capture a Time-Lapse video on your iPad mini 4. Learn how to record a video using your iPad mini 4. See how to edit a photo using your iPad mini 4. Learn how to change between front and rear view on your iPad mini 4 camera. Discover how to take a photo using your iPad mini 4. Continuity allows seamless movement between your iPhone, iPad, and Mac, or when using them together. If you can't transfer media between your Apple iOS device and PC, view this info. Here's how to add a contact on your iPad. Here's how to delete a contact from your iPad. Here's how to edit contacts on your iPad. To view where a phonebook contact was imported from, see this info. See how to add a new contact to your iPad mini 4. Learn how to add a contact to your Favorites on your iPad mini 4. See how to add a picture to a contact on your iPad mini 4. Learn how to assign a ringtone to a contact, so you know who's calling your iPad mini 4 without looking at it. Learn how to import and export your contacts on your iPad mini 4. Learn about the options to add bonus data to your devices on the new Verizon Plan. Learn about how your devices use data and what tools are available to monitor your data allowance. See how to view current and historical data usage and set up data alert messages. Learn about a free online tool that helps you understand how the devices on your account are using data. Access it through My Verizon and My Verizon Mobile. Here's how to activate cellular data on your iPad. Learn about the data gifting program where you can give extra data to others as a gift, and receive it too. Here's how to add to or change your Prepaid data plan on your iPad. Here's how to sync your cellular account with your iPad if you are having connectivity or billing issues. Here's how to view cellular data information on your iPad. Here's how to cancel a prepaid data plan on your iPad. Here's how to edit user and payment information for your iPad's cellular data account. Here's how to turn cellular data for your iPad on or off. Here's how to reset your iPad's cellular data account if you are having connectivity or billing issues. If you've forgotten the password for your iPad's cellular data account, view this info. Here's how to view the Prepaid cellular data usage on your iPad. Here's how to view data usage and set data warnings and restrictions on your iPad. Here's how to turn cellular data for automatic downloads on your iPad on or off. If you can't connect to the internet or send or receive email, text, or pics, view this info. If your Apple iPad shows the incorrect date and/or time, view this info to correct it. Learn about the Damaged Device Fee that's charged if you turn in your device for a Certified Like-New Replacement and your returned device has been misused. Here's how to view info (e.g., ID, SIM number, trade-in value, etc.) for a device on your account via the My Verizon website. Here's how to view your iPad's phone number. Here's how to view your iPad's device ID number. Here's how to view device info (e.g., storage amounts, unique data, etc.) for your iPad. Here's how to help determine if your device has damage. Here's how to view your iPad's MAC address. To use Spotlight to search for content on your Apple device, swipe down on your home screen to reveal the search field. View this info for more Spotlight functionality. Here's how to turn 4G LTE data for your iPad on or off. If your Apple iPad crashes, resets or runs slow, or apps freeze or reset the device, view this. View this info to limit the device/consumer info on your iPad that's accessed by advertisers or apps. Here's how to turn status bar or banner notifications for your iPad on or off. Here's how to start something on one device and pick it up on the other devices using your iCloud account. For operating temperatures and temperature management of your Apple device, view this info. To turn Verizon network services on/off or if they aren't functioning, view this info. Here's how to adjust the display brightness on your iPad. Here's how to change Control Center settings on your iPad. Here's how to adjust the color temperature of your iPad's display to make it easier on your eyes. If you're not receiving calls or alerts for your texts and email, view this info. Here's how to turn the Screen Time setting for your iPad on or off. Find out how to access mobile network settings on your iPad mini 4. Explore how to access Settings on your iPad mini 4 to change alert sounds, turn off GPS and more. Discover how to add an account on your iPad mini 4. Discover how to adjust Auto-Lock preferences on your iPad mini 4. A visual guide for swiping between multiple Home screens on your iPad mini 4. Learn how to change the account settings on your iPad mini 4. An interactive guide for changing the notification sounds on your iPad mini 4. Learn how to check for and install a system update on your iPad mini 4. Learn how to manage Location Settings on your iPad mini 4. Explore how to manage the Background App Refresh on your iPad mini 4. Discover how to manage data usage on your iPad mini 4. Learn how to manage the battery on your iPad mini 4. An interactive guide on how to remove an account from your iPad mini 4. See how to dim your lights by scheduling Night Shift on your iPad mini 4. See how to set up Touch ID on your iPad mini 4. An interactive guide for setting your iPad mini 4 to Airplane Mode. Here's how to unlock your Gmail Account if you don't know your username or password. Removing then re-adding an email account on your iPad often fixes email issues. Here's info on personal email settings for your Apple iPad. Here's how to reply to an email message from your iPad. Here's how to compose and send an email from your iPad. Here's how to adjust how often your iPad checks for new email. Here's how to remove a personal email account from your iPad. Here's how to forward an email message on your iPad. This often helps if you get emails on your computer/PC but not on your phone. If you're having other issues with your phone/device, visit our Troubleshooting Assistant. These walk you through solutions for issues you may have with your device. Here's how to delete email messages from your iPad. If you're not able to send email with Mail on your iOS device or if you're not able to receive or move messages, view this info. Here's how to view a Gmail message on your Android smartphone / tablet. Here's how to find the steps to add an email account to your iPhone or iPad. Here's how to add a personal email account to your Apple iPad. Here's how to allow your email to be accessed from multiple computers or mobile devices. Here's how to manage your Gmail notification settings for your Android smartphone / tablet. Here's how to complete a manual (advanced) email setup on your iPad. Here's how to add a work email account on your iPad. Here's how to view email messages on your iPad via the Mail app. If you need corporate email settings info for your Apple iPad, this may help. To enter or edit an email signature for your iPad, view this info. Learn how to access your work email on your iPad mini 4. Discover how to access your existing email account on your iPad mini 4. Discover how to change email inbox views on your iPad mini 4. Find out how to remove an email account with your iPad mini 4. Learn how to attach a file, like a document or photo, to an email with your iPad mini 4. Learn to fix your personal and corporate email with just a few simple steps. Learn about location based services. Here's how to turn GPS location for your iPad on or off. Here's how to reset your iPad's location warnings to the default settings. Here's how to quickly search for contacts, emails, and other content on your iPad. Here's how to create, delete, or email a Note on your iPad. Here's how to see current display icons for your iPad. Here's how to view notifications on your iPad. Here's how to switch between Home screen panels on your iPad. See how to add a widget on your iPad mini 4. Learn how to add or remove a Home screen page on your iPad mini 4. Find out how to create folders on your iPad mini 4 to help organize your apps. See how to manage apps and widgets on the Home screen of your iPad mini 4. Discover how to manage widgets on your iPad mini 4. Discover how to remove apps on your iPad mini 4. Find out how to remove widgets on your iPad mini 4. Learn how to use Quick Reply on your iPad mini 4. Get an Internet connection by accessing your device's Wi Fi using Mobile Hotspot. Learn how to connect devices. Understand how your plan will be charged. Refer to this Apple support article to troubleshoot common issues with your Personal Hotspot. Here's how to set up or activate the hotspot on your device for use as an internet or Wi-Fi connection. Here's how to turn your iPad's personal hotspot feature on or off. Here's how to change the Personal Hotspot settings (Wi-Fi password) for your iPad. Here's how to share your internet connection on your iPhone or iPad with other devices. If you're having trouble connecting to the Internet or a web page won't display, follow these steps. Here's how to check if you're offline if you can't connect to the internet via computer with Internet Explorer, Chrome or Firefox. If your connection speeds are slower than expected here's info on how you can test them. Here's how to add a browser bookmark on your iPad. Here's how to turn your iPad's private browsing feature on or off. If you can't connect to your Wi-Fi router, rebooting or restarting the may help. If your iOS device isn't recognized in iTunes on Windows, view this info on restarting the Apple Mobile Device Service (AMDS). If you can't browse the Internet or view website images on your iPad, view this info. Here's how to delete a browser bookmark on your iPad. Here's how to edit browser bookmarks on your iPad. Here's how to connect to a website from your iPad's browser bookmarks. Here's how to access your iPad's web browser (Safari). Learn how to bookmark a website on your iPad mini 4, so it's easy to find later. Explore how to change your Safari® content settings on your iPad mini 4. Discover how to find clear the browsing data on Safari® in your iPad mini 4. 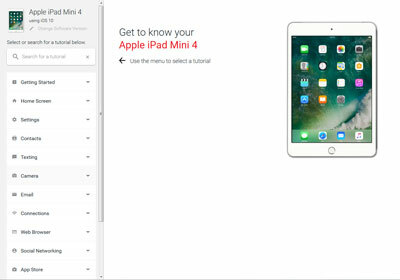 A visual walkthrough of opening, closing and switching between windows or tabs in the web browser of your iPad mini 4. Here's how to use your iPad's Smart Connector feature. Here's a link to info on how to perform certain gestures on your iOS device, like a pinch or multi-finger swipe. Here's how to remove saved words you have typed and return your iPad's keyboard to its default dictionary. Here's how to create a text replacement shortcut on your iPad. You can use voice input on your Apple iOS device to type hands-free instead of using your keyboard. Learn the basics about using Asian languages on smartphones or tablets, including how to find a device that offers the language you want. Here's how to change the language and region settings on your iPad. Discover how to change the language settings on your iPad mini 4. A visual guide on how to charge your iPad mini 4. Here's how to fix the screen / display on your iPad if it doesn't flip or rotate. If you've forgotten the password for your iPhone or iPad or your device is disabled, view this info. Here's how to lock or unlock the screen on your Apple iPad. Here's how to turn Touch ID for your Apple iPad on or off. Here's how to turn your iPad's password unlock setting on or off. Here's how to set up Touch ID on your Apple iPad. Here's how to manage the Touch ID Settings for your Apple iPad. Here's how to unlock the screen on your iPad.. Here's how to obtain more info from Apple on the Two-Factor Authentication used during setup. Here's a link to info on how to use your fingerprint to easily get into your iPhone or iPad. Here's how to add additional fingerprints on your Apple iPad. Here's how to remove saved fingerprint entries from your iPad. If you want your iPad to remain on one app and control what is available when enabled, view this info. A visual guide for setting screen security on your iPad 6s to help protect your private information. See how to unlock the screen on your iPad mini 4. Here's how to increase or check your Verizon Cloud storage space via the Cloud website. Here's how to free up space if your device runs slow/crashes, apps freeze, or you can't save media. See how to set up a mobile hotspot password on your iPad mini 4. An interactive guide for setting up your iPad mini 4 as a Mobile Hotspot, so you can share your data connection with other devices. Here's how to play music files on your iPad. Here's some info on your iPad's Control Center menu. To learn how to control your iOS device using a single switch or multiple switches view this info on Switch Control. Here's how to open multiple apps at once on your iPad. Here's how to open multiple apps at once in split screen view on your iPad. Learn how to manage open apps that are running on your iPad mini 4. Here's how to check for or install software updates using iTunes. If your iPad crashes, has a blank or frozen screen or calling, app and sync issues, view this. To view the software version your Apple iPad is running, check out this info. If you're getting a "The iPhone [device name] could not be restored. An unknown error occurred [error number]" error message when updating or restoring your iOS device, view this info to correct it. Here's info on how to update your iPad to the current iOS version. Learn about Apple operating system iOS 11, including features delivered with this update and what devices are compatible. Note: Apple iOS 12 is available as of September 17, 2018. Learn about the new Apple operating system iOS 12, including new features delivered with this os update and which devices are compatible. Discover the benefits of the most recent software update and view instructions to see how to download the software to your device. If you're unable to make or receive calls or connect to the internet, this could help. Inserting or removing a SIM is helpful when receiving activation errors, trouble with the browser or a blank/frozen screen. This only helps with viewing the SIM card number/ID on your iPad. Here's how to remove a SIM card from an Apple iPad. Here's how to turn your SIM pin on or off for your Apple iPad. If your SIM PIN is blocked, here's info on how to unblock it. Here's how to change the PIN for the SIM card associated with your iPhone from the default value. Here's how to enable, disable or modify the SIM PIN on your iPad. Find out how to insert and remove a SIM card from your iPad mini 4. Learn how to find the SIM PIN and PUK numbers for your 4G LTE SIM card. Discover how to access your Facebook account on your iPad mini 4. Find out how to add a Twitter acount to your iPad mini 4. Learn how to log out of Facebook on your iPad mini 4 to help protect your account. A visual walkthrough on how to update your Facebook status and post photos using your iPad mini 4. Learn how to tweet with Twitter® on your iPad mini 4. If you want to change your Facebook privacy or security, here's how to access those options. If you have audio problems from the built-in speaker on your iPhone or iPad, view this Apple support article. Here's how to test the microphone functionality of your iPhone / iPad. Here's how to view signal strength on the Apple iPad. Here's how to send a text message from your computer via the My Verizon website. Learn about the basic use of Verizon Messages, a text messaging app that lets you easily send and receive messages, attach photos to texts or group message. With Verizon Messages, schedule a message to be sent at a later time or date and use driving mode to stay safe while you're on the road. Here's how to create and send a text message on your iPad via the Messages app. Add a personal touch to your messages with some of the easy tools in Verizon Messages. Customize pictures, and even send an eGift from one of over 30 merchants. If you can't send or receive messages on your iPhone or iPad, view this Apple support article. Here's how to delete text messages from your iPad. Learn how to change message settings on your iPad mini 4. Find out how to delete conversations on your iPad mini 4. Discover how to send a text message with an attachment using your iPad mini 4. Find out how to send images from your iPad mini 4. Learn how to turn off notifications for group messages from your iPad mini 4. A visual guide for how to turn iMessage on or off using your iPad mini 4. Here's how to set up remote printing on your iPad. Here's an Apple support article on how to use AirPrint to print from your iPhone or iPhone. Here's how to capture a screenshot using your iPad. Find out how to change the FaceTime settings on your iPad mini 4. Discover how to create a medical ID on your iPad mini 4. Discover how to perform a factory reset on your iPad mini 4. Learn how to use FaceTime® on your iPad mini 4. Learn how to save data by turning off Wi-Fi Assist on your iPad mini 4. Learn how to communicate using 3D Touch on your iPad mini 4. See how to use 3D Touch within an app on your iPad mini 4. Find out how to use 3D Touch on the Home screen of your iPad mini 4. Find out how to create a live picture on your iPad mini 4. A visual walkthrough on how to view your health data using your iPad mini 4. If you want to change how an app works with Guided Access enabled, view this info. If you're getting an error message when placing calls, here's how to check assisted dialing. Here's how to configure common accessibility options for your iPhone or iPad. Here's how to configure VoiceOver settings for your iPhone or iPad. Here's how to turn Zoom and Magnifier on or off for your iPhone or iPad. Here's how to set the wallpaper image on your iPad. Discover how to change the background of the Home screen on your iPad mini 4. Use Wi-Fi to get a wireless connection to the Internet. Learn how to use Wi Fi to avoid data charges. If your iPhone or iPad won't connect to a Wi-Fi network, view this Apple support article. If you can't connect to the internet or send or receive email and messages, view this info. To remove a saved Wi-Fi network from your iPad, view this info. Here's how to add a Wi-Fi Network on your iPad. Here's how to turn your iPad's virtual private network settings on or off. View this info if the Wi-Fi network you want to add to your iPad doesn't display. Here's how to add a Virtual Private Network on your iPad. If your iPad's cellular data usage is higher than expected, check this setting. To turn Wi-Fi on/off view this. If you're having trouble connecting to Personal Hotspot, make sure Wi-Fi is off. If you want to make or receive calls from an another device logged into the same iCloud account, view this info. Learn how to use your iPad mini 4 to connect to a Wi-Fi network, so you can access the internet without using data. Having issues with your Wi-Fi connection? Have no fear! Follow these simple steps to get your Wi-Fi connection up and running.